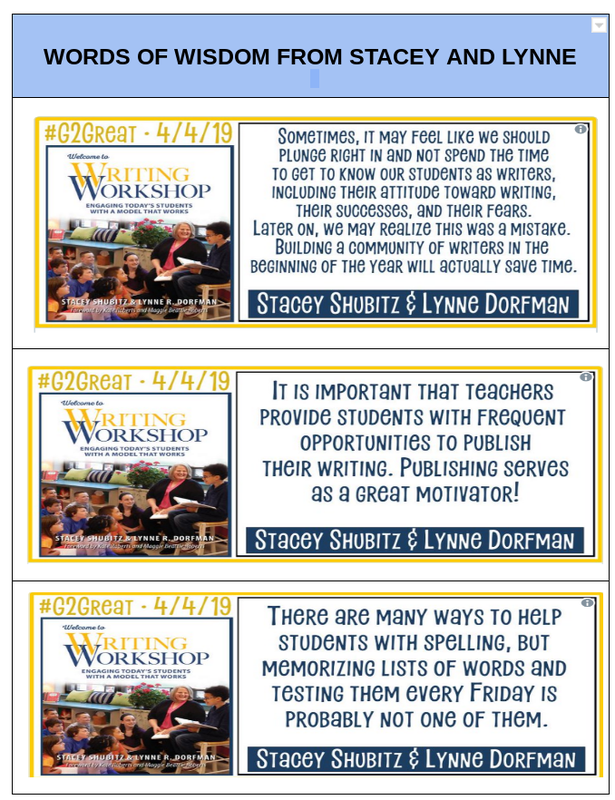 The #G2Great chat on Thursday, April 4, 2019 welcomed writing workshop aficionados near and far as a powerful duo, Stacey Shubitz and Lynne Dorfman, joined us to chat about Welcome to Writing Workshop: Engaging Today’s Students with a Model That Works. It was an hour of celebration as well as an hour of learning and affirmation of basic principles of writing workshop practices. 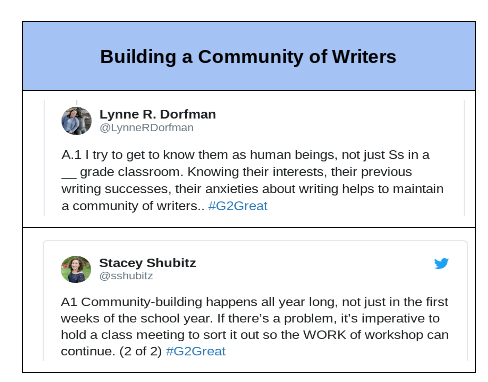 In this blog post, you are first going to see Stacey and Lynne’s responses to three questions about their goals and messages for Welcome to Writing Workshop. 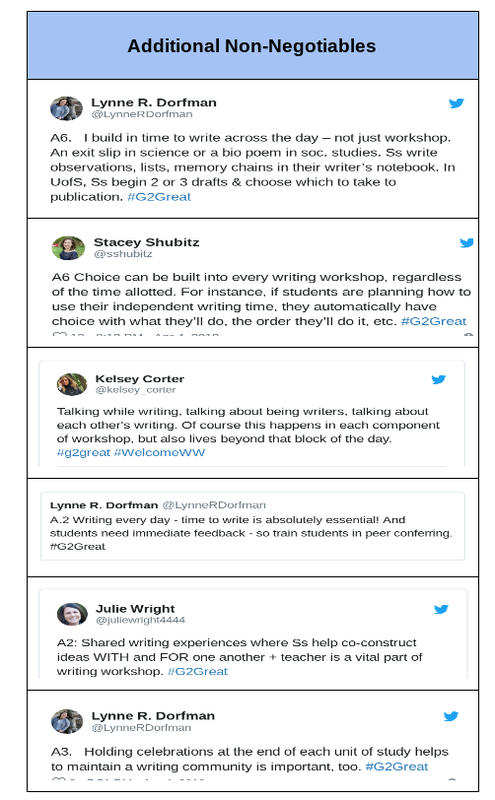 And then you will view some curated tweets that are representative of just a small portion of the tweets generated during the #G2Great chat, followed by some additional resources available to support your learning. 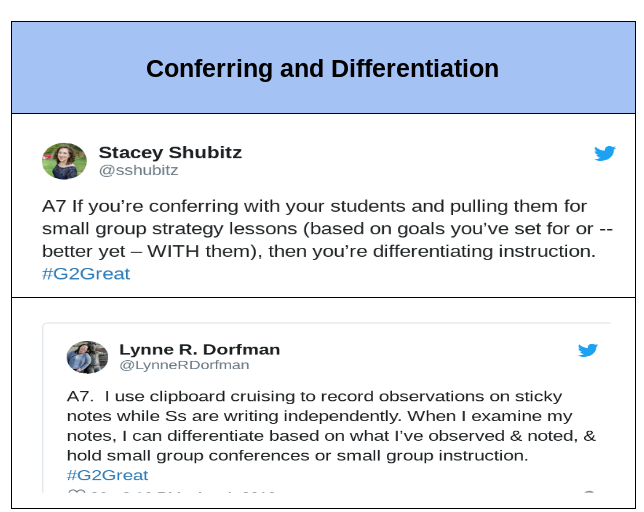 Stacey: Write alongside your students no matter how uncomfortable it feels at first. Keep doing it. Day after day, it will become easier. If you’re writing, then you’re part of the classroom community of writers and that is the secret to being a great teacher of writing. Lynne: Of course, that a teacher of writers has to be a teacher who writes. Writing is not a spectator sport – you have to jump in and play the game! Modeling with your own writing and thinking aloud so you can make your process visible to your students. So, an understanding of the importance of writing process. Also, we talk about the importance of the physical and the socio-emotional environment. Our workshop should look like, sound like, and feel like it is student-centered where our young writers have a voice and lots of choice. Another big takeaway is daily time for writing which involves good planning so we can move through a literature hook, modeling, active engagement, and on to writing. Closing with reflection is also essential. Stacey: There were two motivations for writing this book. First, we were both adjuncting and noticed there hadn’t been a new, stand-alone book on the fundamentals of writing workshop in quite some time. I was teaching online and had grad students in my classes from across the USA and around the world (e.g., India, Peru). Many times my international students were unable to get print copies of books and wished there was an ebook they could purchase on writing workshop. Therefore, we thought it would help if there were a new book, that would also be an ebook, about writing workshop. Second, through the consulting work we do, we noticed that many teachers are given a curriculum to teach writing, but they are unfamiliar with the guiding principles that make writing workshop work. Therefore, we wanted to write a book for people who were new to teaching writing workshop so that they would have a solid foundation on which to implement the curriculum they were given. Lynne: I have wanted to write this book for years and years! My interest in writing began in elementary school. I was inspired by my sixth grade teacher, Mrs. Steinberg and even tried to write songs. I loved playing folk guitar. Later, I became an NWP fellow through the PA Writing & Literature Project. 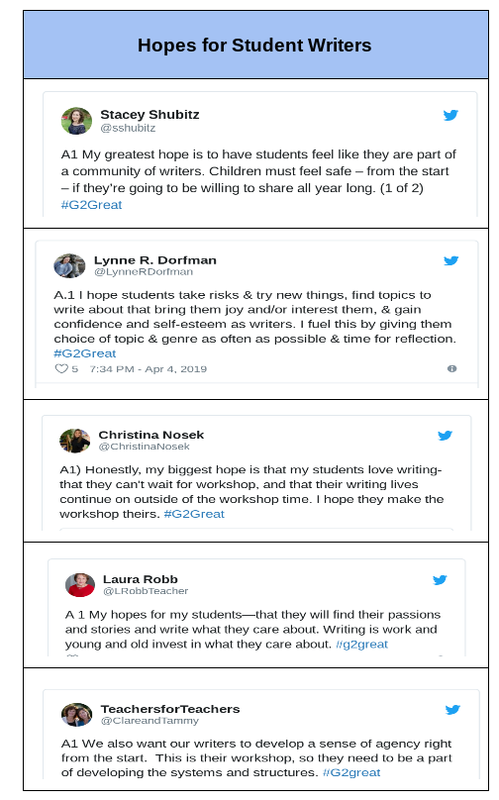 As I began teaching graduate courses on writing and presented at conferences, I realized how many teachers were uncomfortable with their own writing and with teaching writing. 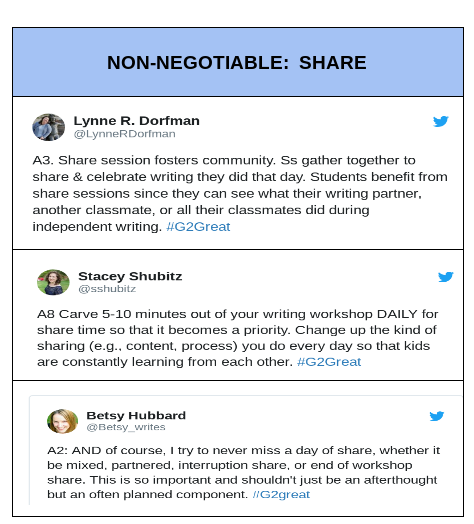 When Stacey and I got together to talk about the possibility of writing a book about writing workshop, we realized that the last book that discussed workshop essentials was a book by Ralph Fletcher – Writing Workshop: The Essential Guide. Ralph’s book was not available as on online publication. It was a 2001 copyright, so we thought there was room for our book. Our goal was to provide video clips as well so teachers could have a glimpse into writing workshop classrooms. 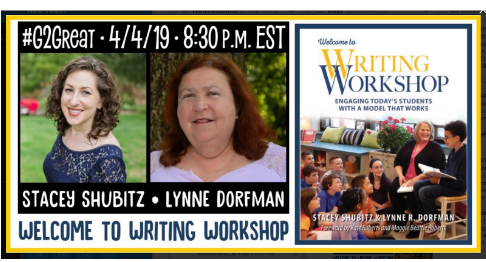 In Welcome to Writing Workshop, teachers will find tips to enhance their writing instruction including how to manage time, choice, environments and the socio-emotional supports to engage ALL learners. A teacher who is interested in “re-invigorating” or making their workshop more joyful will find the essential information in this text and supporting materials and videos. The pause at the end of each chapter in the “When You’re Ready” section provides the time and space for the reader to reflect and consider how to best use their new learning. Check it out! You won’t be disappointed!